Last Thursday I got a note from my friend Anna wishing me happy birthday and hoping that I’d enjoyed the gift she sent. Gift? Oh dear, how awkward. I may be terrible at remembering other people’s birthdays, but I’m pretty good at remembering when people send me things (especially Anna — she’s one of the best gift givers I know; so good at coming up with interesting, thoughtful and totally unexpected ideas). 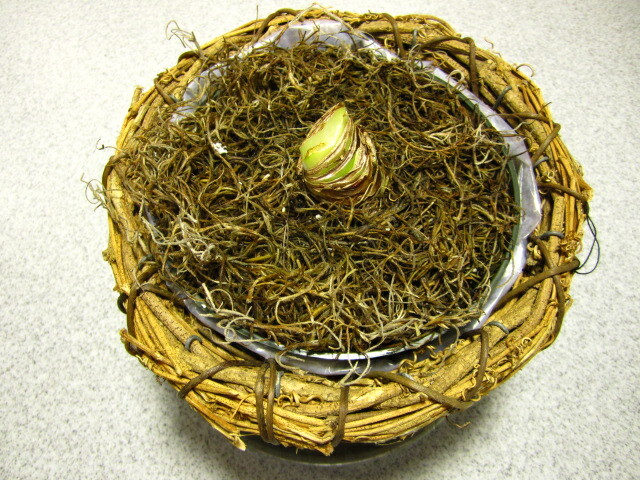 Mortified, I rushed home and opened the box, discovering the maddest looking amaryllis stump I’d ever seen. I watered her, trimmed her curling brown ends, and set her free under a spotlight. We aren’t on speaking terms yet (she just sits there ignoring me), but I’m hopeful that with some diligent love and attention (or, at the very least, Miracle Gro), I’ll be able to get her to open up. I’ll keep you posted.